A handful of workers showed up at the junaglow yesterday and demoed our master bedroom and bathroom. We’ve moved our bedroom to the dining room for the next couple of months while the remodeling is going on which is both extremely hectic and super (dooper shmooper) exciting. Above you can link through to see some of the inspiration images we’ve pulled for the look of the master bath. It’s a small space. About 5′ X 7′ and, as you can see by the inspiration images, we’re not yet sure of the stylistic direction, besides that, well, it’s gonna be jungalicious. I’m still obsessed with both patterned cement tile and mosaic tile (like we used in our kitchen overhaul), and am also thinking about designing some custom pieces to go in there, perhaps a custom vanity made from reclaimed wood– I dunno, we’ll see. I love the idea of a walk-in shower, but after doing a bit of snooping I hear they can feel cold. Do any of you have open showers? What do you think? That picture above with the reclaimed doors as shower doors? Yeah, dreamy. I’m checking eBay and Craigslist daily for some old doors like that. Wouldn’t that be amazing? Stay tuned for details and updates as we design the check out of those 5×7′!! Love the idea of a walk in shower. Considering it myself for our upcoming bath reno. If you can, add radiant heat with an electric mat in the floor areas outside the shower. Dreamy on your feet! Can’t wait to see what you do! such a good call. If we can afford it, I’m SO doing that! I used to have a walk in shower and didn’t have a problem with it getting cold, but we also had a heating fan in there that got the room pretty toasty- and we had a dual rain shower/handheld so there was plenty of hot water in every direction! I loved it. Love the idea of a heating fan!! Thanks for sharing! Open showers can feel drafty to me, but expanding on what Brooke said above, a larger shower head (or two coming from different directions!) takes care of the chill and feels luxurious! Oh yes! Dreaming of the double shower head now ;)!! this sounds ridiculous but we have never had the courage to do a remodel as you call it where you guys are, in oz we call it a renovation…, so we lived in an old dark house for forever but just loved its history, when we moved interstate we chose a newer home & love all the ‘extras’ that come with a new house, but not an ugly one, we just spread all our ‘props’, art, artefacts etc, masses of it, so we still have character we did change the carpet for lovely oak floors, but really, where I am heading is, I think it takes courage to make a home exactly how you would like it, so hats off to all you guys!! lovely little lively home, Justina! i just watched your persicope tour! loooove! so excited to see the reno. hoping to make it up to greenville for makers summit, would be so rad to see you! Ohhh I will love to see how your bathroom will shape up! 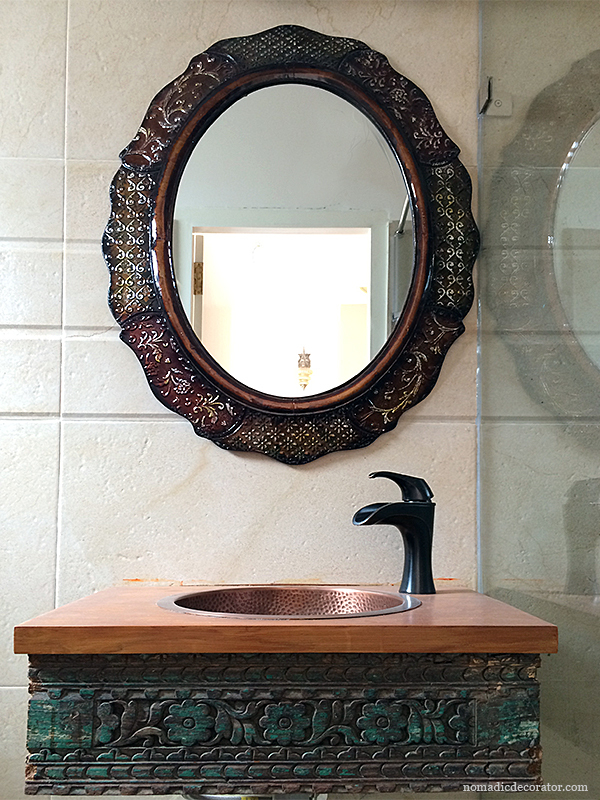 I LOVE the idea of a custom carved wood vanity! I made a vanity with old reclaimed wood for our apartment in India — it was carved chippy paint wood from a door surround in India. Of course we love that old look here in the U.S. but the India contractors kept calling it old wood to be disposed of — they wanted to give us new wood! No way! It got a bit messed up as they used rudimentary tools on it. I need to take wood filler and paint on the next trip and fix it up. But here’s a pic of the vanity: http://nomadicdecorator.com/wp-content/uploads/2015/10/Master-Bath-Vanity-Carefully-Composed.jpg — it’s a super small space; the vanity had to be smaller than 22″ to allow room to use the toilet. This vanity is right inside the bathroom door and you see it from the master bedroom and the bed, that’s why it was so important for it to look good. Problem is the P-trap is very visible and very ugly white plastic!! That’s why it’s cropped out. :) Gotta fix it. So, I am very, very not sure about double shower heads..you probably can have them, but you’re not allowed to use them at once. As for the mood board-it is wonderful, and it’s going to be amazing. I always loved the picture of this multi-patterned tile. Dream. The only place we don’t touch in remodel is our secondary/kids/guest bath, because it was done relatively recently, and we can’t afford it too..so when/if I’m redoing it sometime later-that’s what I dream to do.. The idea of doors is brilliant. I don’t know how will they hold with moisture etc., but looks so beautiful. I am always cold if the shower doesn’t have some sort of enclosure-either door or curtain..but I’m often cold, so.. Missed the periscope again oi! Could not / would not connect, bonkers. On Open showers – Also a little hazardous if water escapes but aesthetically speaking love the look. Radiant flooring would definitely assist with drying up the spill too! Especially love the all white, spacious yet rustic charm of mixing up the two sizes/ styles of tile in the bottom left hand corner shot. We have all white bathrooms throughout our house. The master bath is clear mosaic on white, which is fab, but it has to remain a no shoe zone. Love a steamy light bathroom- its perfect for ferns!